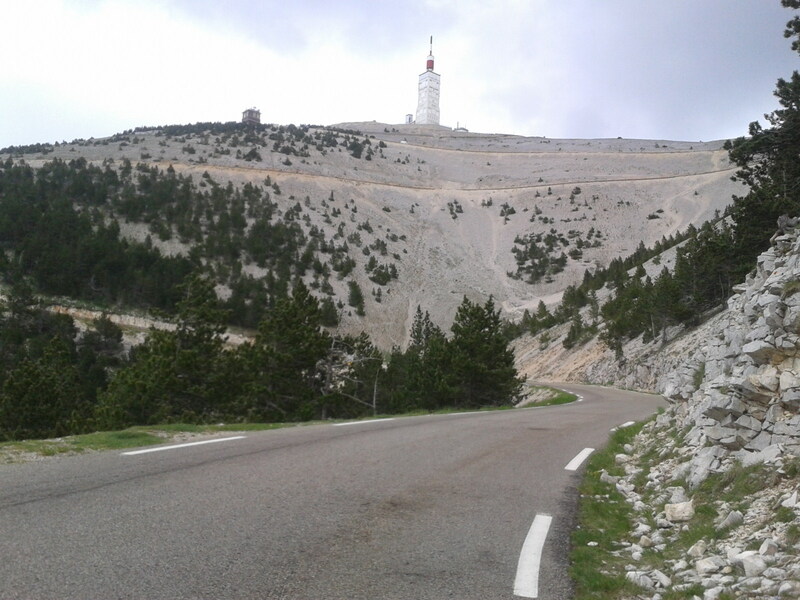 One Ventoux Triple, with Bonus Rant! As I sit here cramming on Provençal history for a tour tomorrow, I realized that I haven’t written about our little adventure yesterday. I’d like to make this a long ranting article – and I may still – but I really need to get past the Romans on my history lesson. 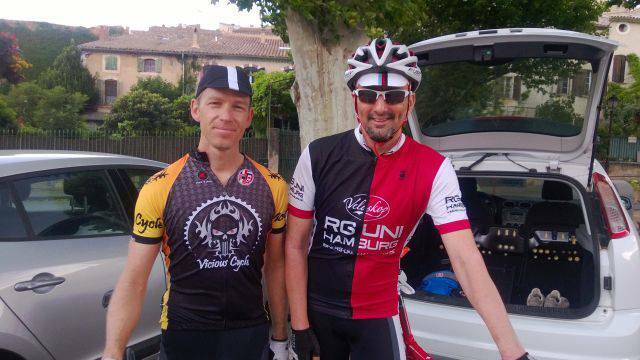 After many months of negotiations, Carsten-with-a-C, from Hamburg, finally got down to Le Sud for his pre-Haute Route Ventoux Triple. Erik was there, too, incidentally, but only made it behind the camera on this ride. We all did our Triples, I’ll have you know, and at least two of the three of us think we are ready for our respective races this summer (I remain the skeptic). But I don’t want to talk about another Ventoux Triple (yawn). I want to talk about Dutch people. These Dutch people. The Weavers and Zigzaggers: these are riders who have not properly considered what it means to ride up a mountain of mainly 10% gradients. Because they don’t like 10%, they reduce the grade by cutting up the road in erratic saw-tooth movements. Weavers and zigzaggers, you are dangerous. Ventoux descenders reach speeds of 80 kph. Zigging and zagging into the left lane is asking for a whole lot of trouble. It also makes those coming up behind you a little uncertain as to where you actually are on the road. The Pushers and the Pushed: Erik and I saw several instances of this heinous crime being perpetrated yesterday. This is where a rider (read below for this type) is being pushed by two others on either side of him/her. This means that you are riding on a public road 3 abreast, Pushers and Pushed. Even in France this is very uncool. You are sharing this mountain road with others cyclists, walkers, runners, motorcycles, cars, campervans, every type of automobile rally you could possibly imagine, and people who just want to get their Triple over with. Please, have some respect. The Self-absorbed Summit Hoggers: When we got to the top for the 2nd time yesterday we were greeted by a wall of low-landers. A literal wall. I couldn’t ride my bike past the line that marks the top of the mountain because there were lots and lots of Dutch riders, not riding at all anymore, but still taking up all available space. This, to me, is pure and simple ‘group mentality’ at work, and nobody seemed interested that there might be others coming up the mountain to finish their hard-earned climb at the very top. Clients of ‘Gastenhof – Equipe Mont Ventoux‘, you really pissed off one blogger with that move. The Under-prepared Over-estimaters: In general, most of the riders above fit into this last category, too. This is just my personal opinion and I am not exactly ‘bothered’ by it, but I would just like to advise those considering an extreme challenge like climbing Mont Ventoux to think about what it means and assess your abilities realistically before you start. For example, if you are overly overweight or obese (yes, I see obese people on the mountain every time I go) it might not be the healthiest option for a physical challenge. But again, take this one as friendly advice. I don’t want to get preachy. Here is my favorite terrifying view of Mont Ventoux, taken a couple of km below the summit on the Malaucène side. Erik, man of brilliant ideas, decided it might be fun to leave this side (the worst, in my opinion) for last. We all struggled up it with not too much trauma, except for the hurricane-force winds up there by the tower (people were walking their bikes off the summit it was so strong). And, lastly, certain proof that I made it up 3 times. 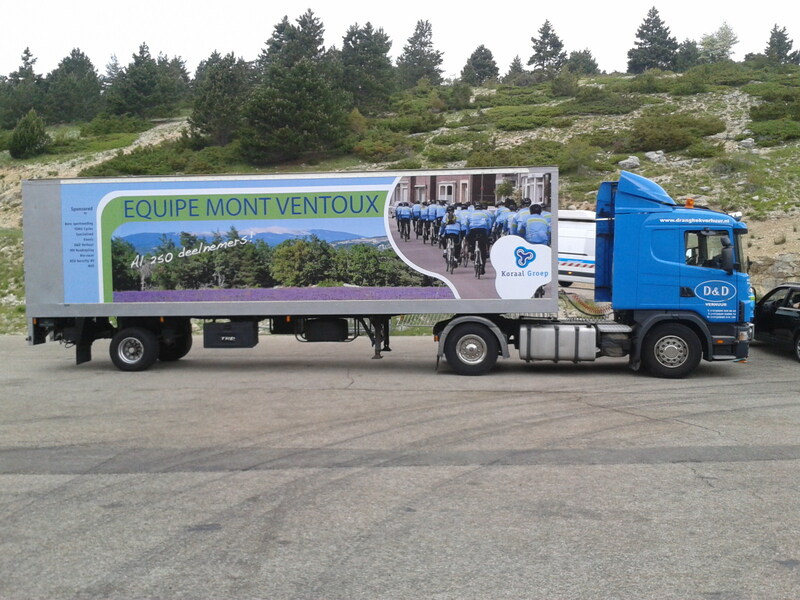 I have 3 more dates with Ventoux planned this season, so big Dutch cycling groups, beware. I won’t hesitate to shame you again to the 10 people who read this blog! 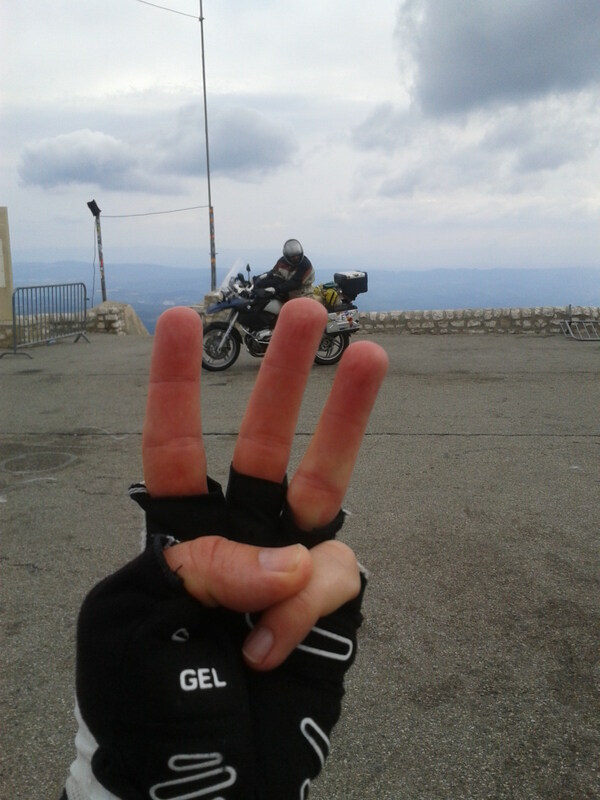 This entry was posted in Cycling and tagged ventoux triple. Bookmark the permalink. Joe, glad I could help! Come on, the pro riders in the Tour de France will do it this year with exactly 20″ of movable space around them at all times. Next time scream really loud between each breath in effort to scare that blockade into clearing a path for you and then shake like a dog to spray your sweat all over those just-been-pushed-up-Ventoux event riders. I can’t comment on those obese people however, cuz I’m feeling a little too like that myself this year. Karen, you give good advice. I suffer like a dog on Ventoux, so I might as well go all out and act like one, too. Eeek. Sounds like your describing me. Weaving and zigzagging – could be. The pushed and the pulled – that would help. Summit Hogger – does laying on the tarmac count? Under prepared Over-estimaters – sitting here nursing yet another cold/flu, it could be me. And the 3 fingers with a motorcycle in the background – the motorcycle is starting to look like a better option all the time. Glad you had a good ride and you’re all feeling pretty confident for the HR. Luc, I’ve ridden the ‘stupid hills of Switzerland’, as my wife called them. I was zigzagging up 20%, too. That was outstanding. I am proud of you. The ride up the hill; was good too. wow, 3 times = respect! Gerry: How do your times on the last climb compare with your best times when you did it only once (I think you hit around 92min you said last time)? Curious because the third climb will probably be similar to Haute Route climbing (with accumulated fatigue, although 3 x Ventoux exceeds the average HR day which I think is more like 2 x Ventoux). It’s not as hard as you might imagine. No, yes it is! I can’t compare at all. Actually I can’t even find my time on Strava somehow. Why no segments for Malaucene…? Even tried making one myself, but it wouldn’t work. Anyway, we weren’t climbing for time, so, for example, on the flatter parts near the bottom, we really were going easy. I wouldn’t want to try and compare this to race pace. Okay, scratch that. I just checked my Polar data and I think the last climb was 1:49. My guess is that HR climbing (after a few days) will be worse than the 3rd climb, in terms of fatigue, simply because it’ll be more accumulated effort, plus we’ll really be racing. I’m going to do a block of hard climbing in early August to try and simulate somewhat the HR, but haven’t planned it perfectly yet. First of all, thanks to Gerry and Carsten for a great day on the mountain. The way the weather looked, I was convinced we wouldn’t be able to get one ascent in let alone three. As for the comments about the Dutch ‘Circus’, I couldn’t agree more. I’ve been on Ventoux three separate days over the past 10 days and twice there have been Dutch organized rides. Both times I have seen dangerous behaviors on the mountain. I don’t want to single out the Dutch, but they are running two-for-two this year in the poor behavior department. My first ride up 10 days ago started with me getting run off the road by a group of supporters that were driving (very slow) behind a group of riders. We were moving through a narrow section of switchbacks when I was forced off the road and ended up hammering on the side of their van and screaming at them in French and English before they finally drove off. Gerry, your comments regarding what we saw yesterday were diplomatically stated in my opinion. The weather was less than ideal which instantly ups the risks for everyone out there. But stopping a van on a bend behind six riders who have stopped for a rider who could not make it is not advisable. I saw a van, six bikes (two laid down on the ground) and riders trying to organize themselves to push someone up the mountain (two pushers) stopped on a bend thus forcing those of us behind them (bikes, cars, and motorcycles, etc.) to either wait or take the risk and put ourselves into the downhill lane on a blind curve. Not a lot of thinking and consideration were going on there. Karsten mentioned that the pro’s go up the mountain with 20″ of space between them. This is just not the case. Even the pro’s and the ‘peloton’ explode and end up with distance between them on Ventoux or a similar climb. Further, they do not have to contend with ‘open roads’ that have two-way traffic and motor vehicles. Seeing a ‘peloton’ of Dutch riders taking most of the road on the climb from Sault was also not encouraging, it was dangerous for them and us (and anyone else that cared to share the mountain.) Gerry has also been gracious enough not to mention the riders that had summited and decided to walk part of the way down the hill on both side of the road thereby creating one lane for everyone else. I’m sure that these groups pay a lot of money to come here and probably require authority to run their events, but they really need to understand that the mountains are no place to fool around and that they don’t own it, not even for the day (not that we do either). I’ve been going to Ventoux since 2007 and I’ve never seen anything like this. One of the best parts of Ventoux is to come out and hear the different accents, talk with people from all over, see jerseys from clubs around the world and share the experience together. It’s a bummer to see relatively few people making a poor impression on the rest of us. Erik, have you sent off that letter yet? You now have their website! And yeah, the weather deserves a blog article in its own right. We had just about everything, didn’t we? Hey guys! I had a great day yesterday. except the cramps on the decent, because of the cold. today quite fatigue. Carsten, thanks for the vote of confidence. What was it that you said? ‘Mamil vs Broom Wagon’? I don’t think this will be the case with either one of us…hopefully. See you in August! You must be in the shape of your life right now, Rich, after the Cents Cols Challenge. I’d say you would be feeling a nice ‘bounce’ on July 6th! I’ve got Carlos-from-Spain on the calendar that Saturday. I’d love to ride the first 200 meters with you, then watch you fly off into the distance. The next possibility is July 19th. Then the last one (for now) is the following week, but it’s a client, so no racing. Do not go this sunday. there are hundreds of belgiums for a kind of granfondo here. even brought there own ambulance…. John and I did our Triple last year on the same day as this event, I think. It was actually tons of fun because, like you said, we had hundreds of people to pass! One hell of a training ride Gerry. Looks like you’re just where you want to be on your road to the HR. I’m not sure, James. I need another ‘bounce’ like I had in April when I climbed Ventoux the first time this year. I’m sure it’s coming. I’m feeling very ‘deep valley’ at the moment. You probably know exactly where it is, but I read there is a 4th route up Ventoux, this one dirt. Just in case, you know, you’re bored or inadequately challenged by 3:-) You would climb all 3 in the time it takes me to climb 1. Maybe less. At least I stay stubbornly and quietly on the side of the road. Oh yeah, love your documentation, it works for me. I’ve totally enjoyed the party-like atmosphere on top of many Pyrenees cols, but this sounds like an uncool, unhappy and probably scary-to-me circus. Is it seasonal? I think I do know that road and I’ve never considered it! You would love the climb, Suze, and I’m sure you would be suitably respectful of it as well. Shall we set a date? I think you mentioned that you were going to use a 11-25 cassette (or something like that). How was it? Luc, it’s working alright. On the Col de la Lusette the other day it was pretty tough going, but I don’t think we’ll have much 16% on Haute Route…I hope. My confidence is growing slightly now. I think I can get through at least a few days with the 25. Ugh, mass cyclotourism. I had to deal with some of that in Colorado, and it was not pleasant. As for the zigging and zagging, I can understand that for very steep grades. I’ve done my share of zigging at 16-20% (or higher), but 10% is ridiculous. They should be able to either stand up for the steeper parts, or spin at lower gears. Sounds like they simply weren’t ready for that caliber of a climb. Your last sentence hits it on the head, Aaron. I love your ‘certain proof’ and confess to being a ‘zagger. I repent.